This time of year, I always start missing color and brightness a bit. I grow tired and bored of camel, burgundy and grey. Blah. It feels like everyone that I follow on Instagram is on some type of insane beach vacation, and it’s got me itching for a getaway of my own… Or at least a little pop of color to an otherwise chilly, lackluster January. In Denver, we usually get pretty lucky with sunny, and sometimes warm, winter days. But, let’s face it… We’ve still got a ways to go before our spring frocks and strappy sandals make their reemergence. Since the long-range forecast is still calling for #sweaterweather, I wanted to share a few of my favorite bright, fun, (and yes, warm) sweaters. I hope they carry you, and all of us, through to the day when dressing for warmth is no longer required. This sweater from H&M is $35 – It is THE prettiest pale minty-green color and has a wide bell sleeve that I’m really digging. I paired mine with leather leggings and my favorite over the knee boots, but could also picture it half-tucked into a flowy midi skirt, or with skinnies and cute flats. Okay, I am o-b-s-e-s-s-e-d with this colorful striped sweater from Lou & Grey. SO SO cute and 40% off right now. It has a wide, boxy fit so it looks great with high-waisted denim or white pants. With the bright, bold coloring, I can actually picture myself wearing it year round …like with jean shorts and cute tennies, for those in-between days when the temp requires that at least half of your limbs are clothed. I like those days. Bottom line: I’m not trading in my booties and jeans for sandals and skirts quite yet – Although, any of these picks would be adorable styled for spring with high-waisted denim shorts… or white ankle pants… or destroyed boyfriend jeans and cute spring-y flats. See? Versatility. I just wanted to share a few fun, sweater options, in case anyone else has the winter blues and is looking for a little color in their life. 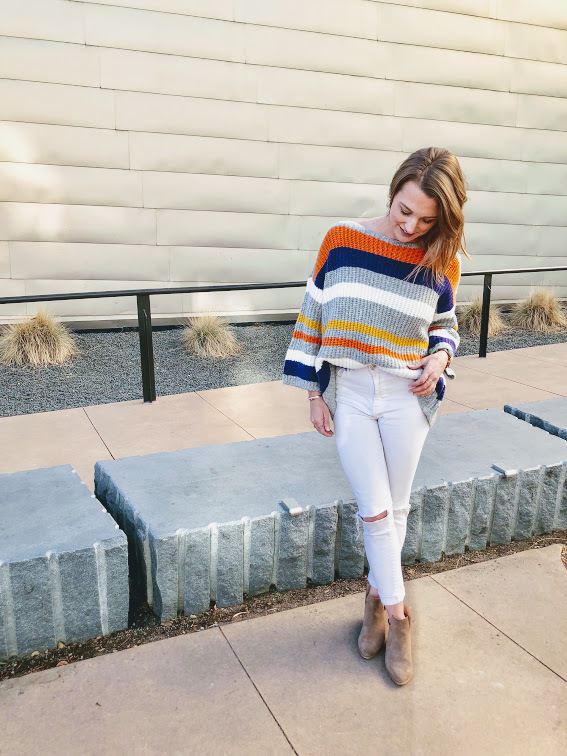 I’ve linked a bunch of other knit favorites below – Some of which will be making their Instagram appearance soon – All options are under $80 and sure to bring some sunshine to your winter wardrobe!